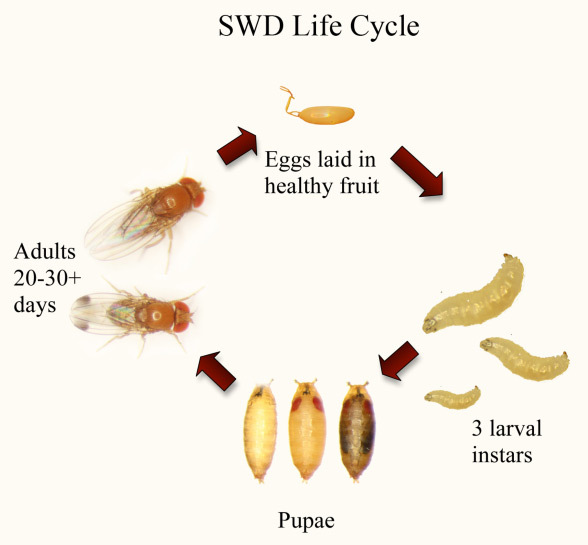 Drosophila suzukii is an invasive plague native to Southeast Asia that has colonized several countries in America and most European countries. This species, whose development is very dependent on temperature and high relative humidity, can attack a very wide range of cultivated and wild fruits. Its ability to reproduce on a wide variety of wild fruits allows it to survive in periods when there are no fruits in susceptible crops. The cultivated species have a very variable susceptibility to D. suzukii, depending on the variety and the degree of maturation of the fruits. The adults have a life of 21 to 66 days depending on the Tª, about 3mm in length and the males present a black spot at the end of the wings, which facilitates their identification. The female, through its serrated ovipositor, inserts the eggs in the fruit and the larva goes through three stages of development. The pupa can be found both inside and outside the fruit and each adult female produces an average of 380 eggs during her life. Thus, the pest completes its cycle in 7-9 days at 21ºC, in 12-15 days at 18ºC and in 79 days at 10ºC. The maximum activity of adults is at 20 ° C and said activity stops above 30 ° C and below 0 ° C.
D. suzukii spends the winter in adult form, being the females more resistant that the males to the low temperatures. The pest presents a reproductive diapause in winter as well as a summer stop during the warmer and drier months. It is in autumn and spring (especially in autumn) when there are very high population peaks that cause significant damage to crops and susceptible wild fruits. D. suzukii affects a large number of cultivated and wild species, among which the cherry, strawberry, raspberry, blueberry and grapevine among others stand out for their economic importance. The particularity of this plague is that, unlike other drosophilids, it can attack healthy fruits. 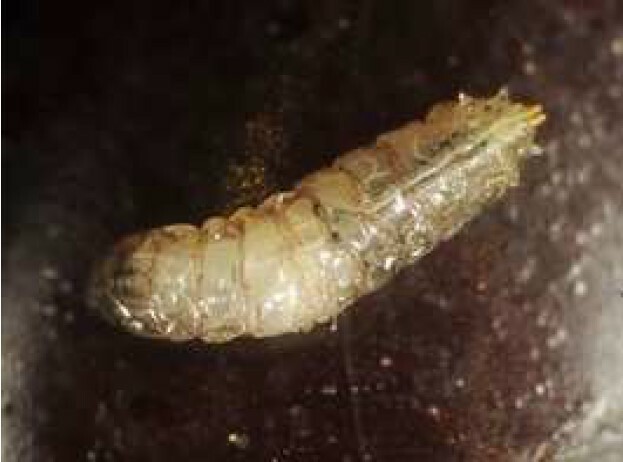 The damage is caused by the sawn ovipositor of the adult female when making the laying and by the larva, which once emerged begins to feed from the interior of the fruit accelerating its softening and dropping. There may be several larvae in the same fruit. Depending on the fruit, you can see the holes resulting from the laying of the eggs, which are then used by the larva to breathe. As the larva develops, around the holes a softening of the epidermis with different tonality can be observed. These wounds may be the gateway for other pathogens. Up to 65 adults have been observed emerging from a single cherry fruit. It is advisable to monitor the flight of adults through the use of appropriate traps and attractants that will be reviewed once or twice a week. With this information, treatments can be carried out with the phytosanitary products authorized for the control of D. suzukii when a significant increase in the population is observed. 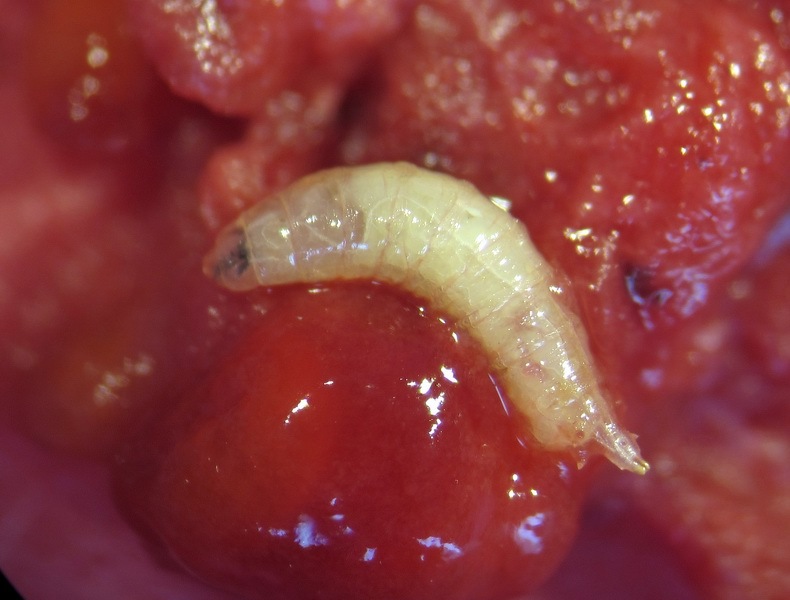 The massive capture, at present, although the system needs to be optimized to reach a level of pest control by means of this technique achieved with other species such as Ceratitis capitata, Bactrocera oleae or Chilo suppressalis, the group formed by the HEMITRAP® Mosquero and the attractive SUZZI LIQUIDO is the product present in the market that achieves a greater number of catches of D. Suzukii, and therefore achieves a better control of the pest than the other commercial products available. In Japan, the zone of origin of the pest, several species of parasitoids and predators of D. suzukii have been recorded. In the areas invaded in Europe and North America, 3 species of parasitoids have been found that can successfully parasitize D. suzukii: Pachycrepoideus vindemmiae, Trichopria drosophilae and Leptopilina heterotoma. Regarding predators, although it has been suggested that some general predators may feed on D. suzukii, to date only predation by Orius laevigatus, which can feed on fly eggs but not on eggs, has been confirmed. 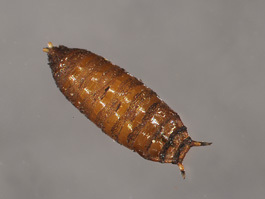 the larvae, and the earwig Labidura riparia that feeds both adults and nymphs of larvae and pupae of D. suzukii. As cultural measures to avoid the proliferation of D. suzukii, it is recommended to maintain a good hygiene of the crop, removing all the non-tradable fruits of the plot, make a good control of the irrigation that avoids waterlogging and carrying out a control of the vegetation by means of an appropriate pruning Avoid excessive moisture, especially in the lower parts of crops.